Delivering dynamic in-app messages is a simple and smart way to improve the metrics that matter to your mobile business. In a sense the easiest way to think of these campaigns is as adverts directed to the audience that is your app users. To give one simple example, if you are an airline they can be used to either upsell extras to customers already booked on a flight, or sell new flights to customers browsing the app. But of course just creating campaigns without thought is going to limit the effectiveness of these campaigns - sometimes to the extent that it is hard to perceive the value they deliver at all. That’s not a great situation for anyone to be in. After all, if the purpose of building a mobile app and getting as many people as possible to use it is improved loyalty and revenues, you want to give yourself every chance to make that happen. With that in mind, here’s five simple ways to make these campaigns work harder for your mobile business and as a result improve the numbers and the ROI on your mobile investment. Hopefully they’ll work for you! The design and delivery of any campaign requires choices to be made. And whenever that’s the case, it’s time to implement some form of A/B testing in order to establish what actually works, rather than what we think might work. Testing isn’t simply limited to creative but can (and should) cover a host of other factors including timing, audience and the format of the messages themselves. As an example consider the use of in-app messages for what we might call ‘feature discovery’ - helping users find functionality they may have missed or not figured out how to use. 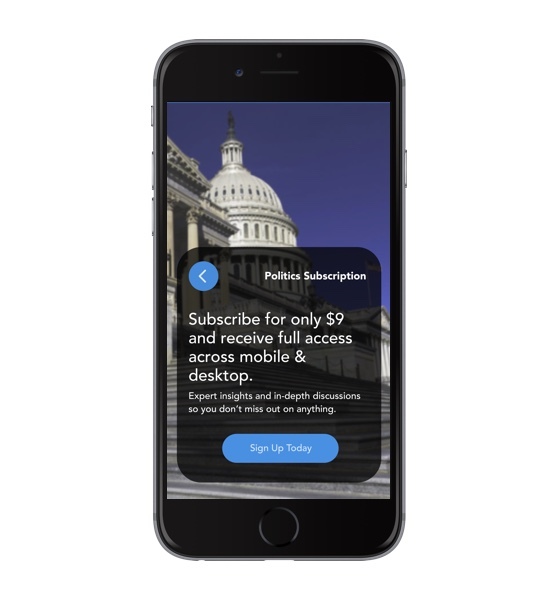 At this point a fundamental decision has to be made between using ‘tip overlays’ or interstitials (examples of both are shown below). This is a classic situation in which testing each approach makes a huge amount of sense - rather than attempting to second guess what might work best. Of course the flip side of testing is measurement. Testing means nothing unless you have real clarity around the performance of competing variants. This means going well beyond click rates to the real user actions you are looking to influence. In this case, broader retention and engagement metrics are appropriate, in addition to feature usage. And always, always decide what metrics will be used to judge success before any test. It is far, far too easy to ‘find’ success after the fact! We mentioned above that in-app messages can be helpfully compared to adverts directed at the in-app audience. If that’s the case, then it makes a lot of sense to think extremely carefully about when a user sees them. After all, most people aren’t hugely satisfied by being sold something (or even told about something) in the middle of an important task. For that reason any business would want to think very carefully about showing in-app messages on app open. That is precisely the time when your users are in ‘task mode’ and are checking a balance or making a purchase. You’re getting in the way. Instead consider when your message might be most appreciated. 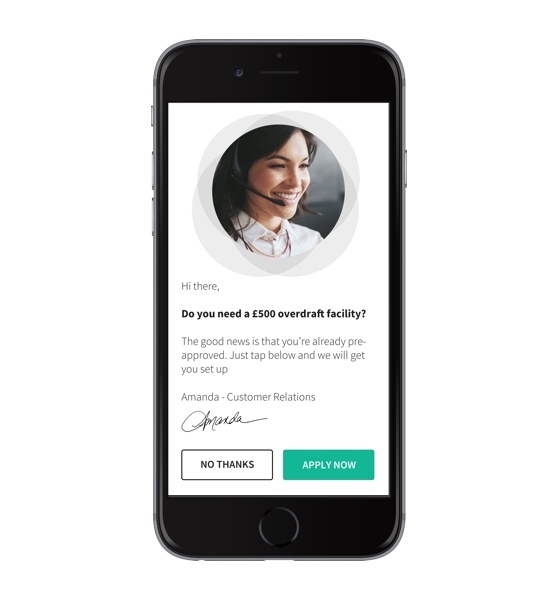 In the example below an in-app message that reminds a bank customer of the availability of an overdraft facility is shown immediately after that user has checked their balance and perhaps found it sadly lacking. Similar use cases can be imagined in telco and other verticals. In each case, the message is triggered and delivered at the right time for the individual, not the time that might best suit the organization. That must be the organizing principle of in-app messages and campaigns. In-app messages and campaigns offer us a great opportunity not just to talk, but also to listen. 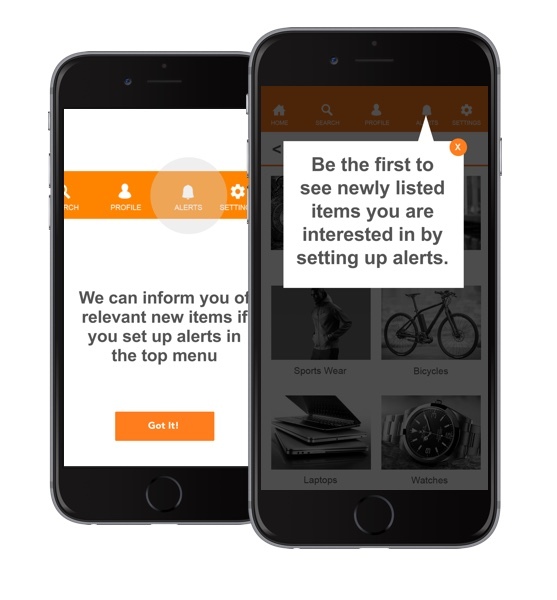 When delivered as interactive messages they allow our mobile app users and customers to speak to us and let us know how they feel about our services and product. And when we serve alternative follow up messages based on that feedback, we have a real conversation going. One example, that we’ve discussed previously in Swrve and implemented for a number of clients, is in-app campaigns that ask for user feedback on the app itself. 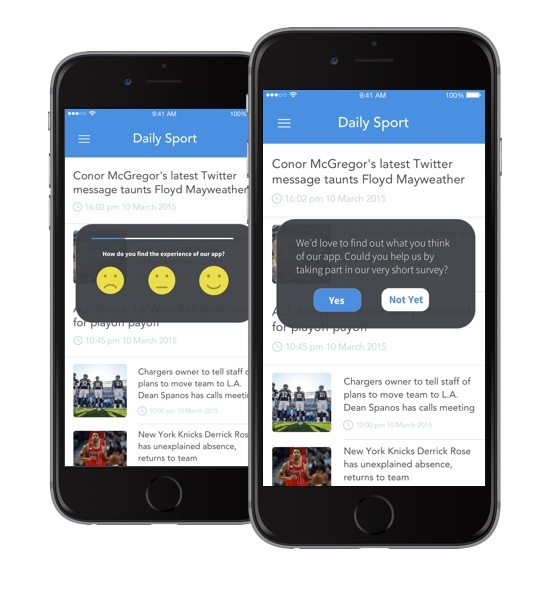 As shown in the example below, an initial message (in this instance delivered from a media organization) simply asks the user how they are enjoying the app experience. It’s what happens depending on the answer that really delivers value all around. If the user indicates that they are enjoying the app, we can then show them a dialogue asking them to rate it in the app store. This is just common sense - it is always wise to only as for public feedback from users who are actually positive about their experience, and have told you this is the case. The result is an improved star rating, and improved app store rankings and acquisition as a result. On the other hand, if the user is not enjoying the app, we can show the message on the right which asks for more specific feedback. This is invaluable - it helps the product team understand where issues are arising and the whole business ensure that in future customer dis-satisfaction is minimized. By serving two completely different experiences, one integrated campaign is able to kill two birds with a single stone. As noted above, in many cases it helps to remind ourselves that in-app campaigns and messages are a form of interruption. If we follow the guidelines in this post, we are increasing the chances of them being seen as welcome interruptions, but nevertheless is always helps to put ourselves on the receiving end and ask just how valuable our messages are. Let’s be honest, an awful lot of organizations end up believing that anything they have to say is intrinsically fascinating when objective reality would beg to differ. So do try and be as tough as possible when answering the “do my audience really want to see this?” question. When you do that, you’ll find that you deliver real value more frequently, drive increased interaction, and do something more than teach your audience to ignore you with frequent irrelevant messages. Shown below is one simple example of what I mean. A simple subscription offer from a media organization, reminding the user that a time-limited discount applies, and tailored to their specific interests. This is the alternative to a message that simply hammers home a ‘subscribe now’ request and (as above) teaches the user that these campaigns offer no special reason to pay attention. 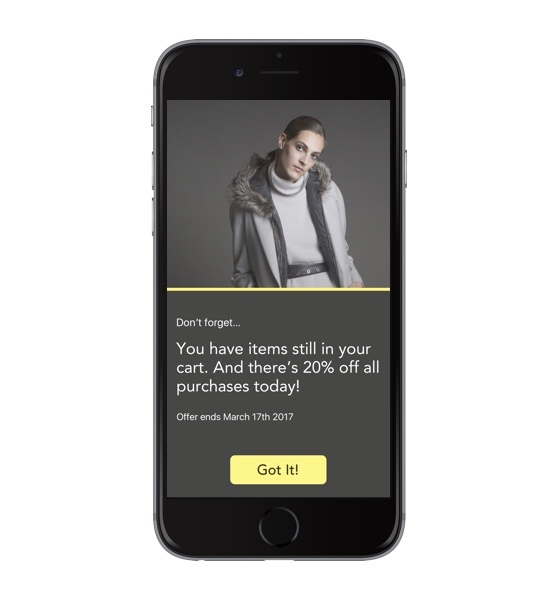 As a rule, if you are sending in-app campaigns: make them count and make them worth paying attention to, even if that doesn’t involve monetary reward or conventional discounts. It’s a given in any marketing activity: more targeting means more effectiveness. If you are delivering campaigns that are intended to change behavior, it helps to get as specific as possible in terms of who you talk to. There’s two reasons for that: firstly, the actual offer you are presenting can be customized to their needs. Secondly, the content, or look and feel of an advertising message, can be designed in a way that appeals to the type of user we are talking to. That may seem incredibly obvious, but doesn’t that in turn make it all the more unforgivable that most in-app marketers use little or no targeting in their efforts? As with most digital marketing situations - we have huge amounts of data. We know almost everything about individual users, certainly when it comes to what they do and have done in our own app at least. That gives us many great possibilities, so ensure you use that data to the max and build in-app marketing campaigns that really move the needle.